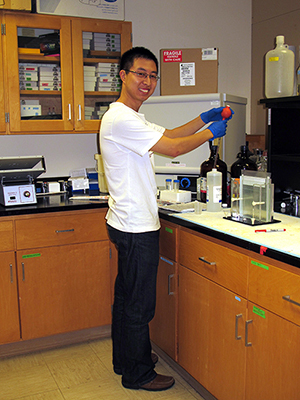 A graduate student works in the laboratory. Completed in 2009, this 13,000-ft2 facility includes specific pathogen-free transgenic animal suites, 2 surgical rooms and adjacent treatment and prep areas, conventional animal rooms, and a separate wing housing wild-caught species. The 2500-ft2 aquatics facilities has 3 test rooms, 2 laboratories and 2 large culture rooms. The cage wash area contains a rack and cage washer, tunnel washer, as well as a pass-through autoclave. The staff includes 5 full-time employees plus student labor. Miami University's Center for Bioinformatics and Functional Genomics (CBFG) provides and maintains equipment to assist in bioinformatic and functional genomic research. The Center for Advanced Microscopy and Imaging (CAMI) at Miami University is a research, teaching and service facility located in Pearson Hall on Miami's main campus. The facility houses 2 scanning electron microscopes, 2 transmission electron microscopes, 2 laser scanning confocal microscopes, a deconvolution light microscope, and a wide-field multimode light microscope. The Ohio Advanced EPR Laboratory was established upon the arrival and installation of a state of the art Bruker® ELEXSYS E580 spectrometer. The lab contains a Bruker® Elexsys E580 capable of pulsed EPR spectrometry, EMX X- and Q- band, and EMX X-band spectrometers capable of continuous wave EPR spectrometry. Abundant growth space for plants utilized in research and teaching is available through over 13,000-ft2 square feet of glasshouse space and the Botany Department Plant Growth Chamber Facility. The Plant Growth Chamber Facility houses a total of 14 controlled environmental growth chambers of various dimensions, which provide ideal growth conditions for experimental plant populations the year round. The Willard Sherman Turrell Herbarium's (Ohio's largest) holdings of approximately 620,000 specimens are worldwide in both geographical and taxonomic coverage. The collection consists of 330,000 vascular plant specimens, as well as 140,000 bryophytes, 100,000 fungi, 35,000 lichens, 10,000 algae, and 5,000 fossil plants. There are several thousand type specimens contained in the collection, as well as many sets of cryptogamic exsiccatae. Active exchange programs are ongoing with many herbaria worldwide to ensure the continued breadth and depth of the collection. The Ohio Eminent Scholars Program and Miami University created the High Field Magnetic Resonance Laboratory in 2006, purchasing the first Bruker® US2 850-MHz nuclear magnetic resonance spectrometer in North America. The lab also contains a Bruker® 600-MHz NMR spectrometer, a Bruker® X-ray diffractometer, and an Agilent® micrOTOF mass spectrometer. The Instrumentation Laboratory is a well-equipped and staffed facility that handles equipment maintenance and repair and constructs specialized equipment to meet individual needs. The Miami University Libraries contain an extensive collection of information, including books, maps, sound recordings, journals, magazines, newspapers, movies, videos, DVDs, and microfilm. Miami University is also part of OhioLINK that provides free electronic access to 12,000 electronic journals as well as thousands of books and other materials. The Brill Science Library contains materials related to the sciences, mathematics, and technology. The Molecular Microspectroscopy Laboratory (MML) is a distinct unit of the Department of Chemistry and Biochemistry at Miami University. The facility provides molecular microspectroscopy instrumentation for joint ventures between the university and other scientific laboratories. The Miami University Center for Neuroscience and Behavior is an interdisciplinary research center dedicated to promoting neuroscience research, as well as to train graduate students for a career in developmental, cellular, molecular, and/or behavioral neuroscienc. A dedicated tissue culture facility consisting of several Forma Scientific® and NuAire® laminar flow tissue culture hoods, double-chamber Nuaire® water-jacketed CO2 incubators, a Hund/Wetzlar® Wilovert inverted microscope and freezers (-20 °C), refrigerators, water baths, bench-top centrifuges, and liquid N2 cell storage vessels. A separate room is dedicated to mouse embryonic stem cell culture, gene targeting and pre-implantation mouse embryo manipulation and transgenesis. The Center for Visual Sciences at Miami University (CVSMU) seeks to promote research and education in all aspects of visual science through outreach programs, collaboration and sponsorship of research, and seminar presentations. The CVSMU works together with other centers in the area as well as non-profit organizations such as Prevent Blindness Ohio. Miami University is also a partner in IDCAST. Led by the University of Dayton, IDCAST is a center in remote sensing and CBRNE sensing technology. Established by a $28-million State of Ohio Third Frontier Grant, IDCAST brings remote sensor and CBRNE sensor technology to market. Through innovative collaborations of academia, Air Force Research Laboratory (AFRL), and industry IDCAST conducts sensor research. The Graduate Program in Cell, Molecular and Structural Biology (CMSB) is a multidisciplinary, interdepartmental program of study and research leading to M.S. (with a thesis required) and Ph.D. degrees. The CMSB program brings together, from various departments at Miami University, faculty and students with broad interests in several areas of life sciences. please complete the Request for Information.